What is the Best Mountain Bike Multi Tool? When you’re on the trail, your bike is put in some rough situations. Even if you have a high-quality mountain bike, you’re smashing it against the ground at high speeds outside in extreme landscapes and temperatures. Screws come loose, spokes get wobbly, tires go flat, handlebars get twisted: you need a way to make adjustments on the fly. Making a quality bike last takes proper maintenance, and to do that, you’re going to need the proper tools. Thankfully, buying the tools to service your bike isn’t very expensive. As long as you occasionally bring the bike to the shop for a once-a-year tune-up, you can do most everything else by yourself at home. Specialized, multi-tools are a great way to service your bike at home or even while you’re on the road. They’re small, lightweight, and easy to throw in a bag—that way you can always have them ready when you’re riding on the trail. The sooner you notice a problem, its more beneficial to you and your bike if you fix it immediately. We checked out the reviews for the best multi-tools available. These two tools were not only the best reviewed but also the most frequently reviewed and favourite features were repeated throughout all the positive reviews. If you pick up one of these two tools, you’ll have your bike fixed up and trail ready in no time. 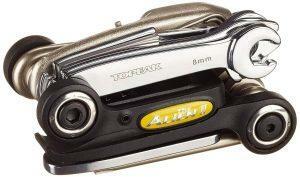 You won’t be short for functions and sizes with Topeak’s 26 Function BicycleTool. This tool has the most functionality of any multi tool on the market. This two-piece device is less than a pound and fits in any rider’s backpack or accompanying carrying case. Here’s what you get in this massive tool: spoke wrenches for spokes in 14g and 15g, two integrated tire levers for filling up the air in your bike’s tires, a T25 disc break driver, screwdrivers (both Phillips and flat-head) a mini-pedal wrench for repairs on the go, eight different sized Allen wrenches, six box wrenches (8-10mm), a steel wire chain hook to fix any kinks in your chain, a stainless-steel knife, a cast Cromoly steel chain tool, and two chain pin compartments. And just for fun, Topeak included a bottle opener so you can crack a beer after the ride. The tool comes with a nylon storage bag that you can clip to your belt. This is the highest reviewed multi-tool on Amazon. Users praise its smart design that allows for the tools to be easily selected, in spite of the wide selection. Other reviewers commented that the tool will last a long time because it’s made out of high quality metal and firm, hardshell plastic. For less than $40, you’ll get practically any tool you could need out on the trial. 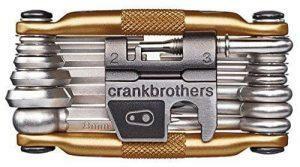 Crank Brothers have a great multi-tool that allows for users to pick the ones they need the most. Here’s what’s in the 19-function multi-tool: seven hex wrenches, four spoke wrenches, large and small, Phillips and flathead screwdrivers, a T-25 Torx disc break driver, a universal chain too, and 8 and 10mm open wrenches. The Crank Brothers tool comes in an aluminium hard case ”tool flask” that you can throw in your bag with ease. You can also get the tool in 17 and 10 functions, which are cheaper because they don’t have as many functions. The 17 is missing the disc break driver and the universal chain, while the 10 is missing the seven hex wrenches. Reviewers can’t say enough about the durability of this tool. One rider says it’s lasted him over 4000 miles of riding. Others say that the 19 is just as good as an at home toolbox. Others say the ergonomics of the tool make manoeuvring it and changing things on your bike very easy. The metal used to make the tool is really tough, you could definitely drop it on the trail and go back to find it later and expect that it will still be ok. Plus, there are options to which tool you can buy, so if you don’t think you’ll be using all 19 functions on the road, you can save money, and weight in your backpack by buying one of the lower-functioning models. Imagine, if you will, that you’re riding your mountain bike on the trail. Right after you hit a huge dirt jump, you realize your handlebars are lost. You land the jump, but it puts your bike’s disc way out of whack. 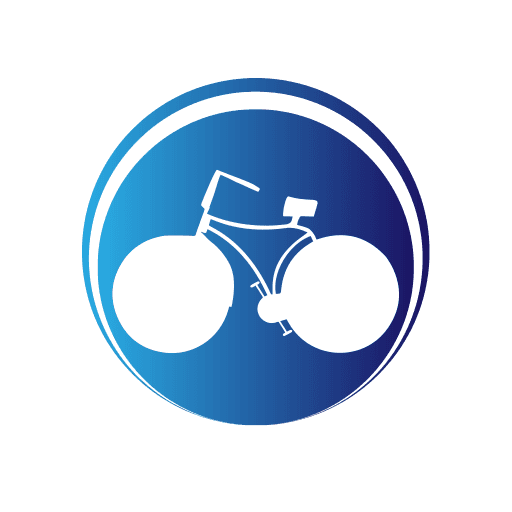 Turning your bike becomes practically impossible. But you’re 10 miles away from your car. Are you going to walk the bike back for the next few hours in the hot sun? Or, are you going to use a multi-tool to fix your disc with your T25 disc break driver? The answer is pretty clear. Having a multi-tool is just smart, safe riding. You don’t need it—until really need it—and wish you had it. That’s why we think you should order the Topeak Alien II 26 Function Bicycle Tool and the Crank Brothers Multi Bicycle Tool. They’re the two best-reviewed mountain bike multi-tool and they can do everything you’ll need from a multi-tool on the trial. The Topeak has more tool functions and it’s easy to pick the tool you need for each task; the Crank Brothers is an incredibly sturdy tool that has a great design allowing for easy manoeuvring and use. Whichever you choose, you’ll be glad you have it in the future when you’re out on the trail and a minor break happens on your bike. You can fix it on the fly before spending more money in replacing a broken part later.